What is the relationship between Daniel’s 70 Weeks and the Jubilee? Will Jesus return on a Jubilee and when is the next Jubilee Year? This article explores those questions. The following article is a guest blog on this site by my friend and outstanding Bible scholar, William Struse. Over the past months, he and I have been in an extended conversation about Daniel 9, the 70 Weeks Prophecy, and the chronology of Ezra and Nehemiah; and how all these issues interrelate. This article is William’s response. We both pray the Holy Spirit guides you all into the truth of this matter. Context, Chronology, & Daniel 9 by William Struse. What if I told you that nearly everything you believe about the Bible’s future prophecies is somehow influenced by an assumption originating in the historical details of Ezra and Nehemiah’s place in the 2nd temple era? What many don’t know is that there is a little known and less understood fact of Biblical history, that is the basis for much of what you and I believe about the 7 year tribulation, the rapture, the 2nd coming of Christ, the identity of the anti-Christ, and most of the events described in the book of Revelation. What I’m talking about is the chronological assumption regarding Ezra and Nehemiah’s place in the 2nd temple era as it relates to an unnamed Persian king who the Biblical record only identifies by the Persian title “Artaxerxes”. You see, there are multiple “Artaxerxes” in the Bible and 99% of teachers and scholars who write about Daniel 9 and the 70 “Weeks” date the starting point of the prophecy from a “commandment to restore and build Jerusalem” which they believe was given during the reign of the Persian king “Artaxerxes” Longimanus. This assumption, in nearly every case, is given without a single Biblical chronological fact from which a reader might attempt to verify the claim. This is important because nearly every event described in the book of Revelation is organized within a framework based at least in part on the 70 Weeks prophecy of Daniel 9. Every interpretation of Daniel 9 and the 70 “Weeks” in turn finds its basis in a “Commandment to restore and build Jerusalem” which is set during the era of Ezra, Nehemiah, and a Persian king who bares only the title “Artaxerxes”. Despite all the incredible theological weight resting upon this 2nd temple era chronology, it is one of the best kept secrets of Bible prophecy. And for good reason as you’ll soon understand. Unfortunately, most of today’s scholars, teachers, and writers on the subject of Bible prophecy are either unaware of the subject, unwilling to deal with the implications, or they are simply depending upon the ignorance of their readers to give them a pass. Frankly, the few who are aware of the challenges this subject poses to our understanding of Bible prophecy are loath to publicly discuss it. Because this is such a critical issue to rightly interpreting the prophetic truth of the Bible, Nelson Walters and I have decided to bring much needed attention to the subject. As Nelson has said in his recent article (here), we don’t share the same point of view, but we are hoping that by looking at this challenging subject from both our perspectives you might be better equipped to sift the evidence for yourself and do your Berean duty to see if these things be so. Are you willing to take this Berean challenge? I hope so, because stewardship of Yahweh’s precious words requires it. And so you don’t think I’m over dramatizing this subject, here are some of Nelson’s thoughts from his Accelerated Ezra Chronology – An Examination which we both have shared on our blogs a couple of weeks ago. Pretty profound implications, don’t you think? This is why Nelson and I have agreed to collaborate. We believe the body of Christ needs to better understand this subject and its implications. Although we have major difference in interpretation; we agree that it is imperative to establish our prophetic interpretation of Daniel 9 upon a solid Biblical foundation of truth, even if that truth challenges our own beliefs and assumptions. This is a subject that has been neglected for far too long. It is our hope, that by taking these first tentative steps to discuss this subject in a public setting with good will and Christian charity we might inspire our fellow believers and peers who care about the subject of Bible Prophecy to take a more serious and disciplined approach to Daniel 9 and its underlying foundational history. As we look at the 2nd temple era history, please keep this golden rule in mind. This rule is a valuable guide for any Berean who desires the truth of the Scripture to speak for itself. My primary aim of this article is not to change your mind about Daniel 9 and the prophecy of 70 “Weeks”, but to strengthen your faith in the Biblical record as an accurate account of the events relating to Ezra and Nehemiah’s place in the 2nd temple era. When we are finished with our exploration of this subject, I hope you’ll have renewed confidence in the accuracy and clarity of what the Biblical record says about the 2nd temple era. That confidence then will give you a more contextual lens through which to view and interpret Daniel 9, the Bible’s most important Messianic prophecy. So without further introduction let’s look at the history behind the Bible’s only prophecy which gives us a specific and datable timeline for the coming of Yeshua (Jesus). Let’s look at the chronology upon which the Bible’s countdown to the Messiah rests. As we explore this contextually based overview of the 2nd temple era we’ll look at and address some of the arguments and objections raised by Nelson in his article: Accelerated Ezra Chronology – An Examination posted two weeks ago at my blog – The 13th Enumeration and at Nelson’s blog – The Gospel in the End Times. In this article, we are going to explore the succession lines of the Jewish priesthood starting with Seraiah (the last high priest of Solomon’s temple) as well as the succession of secular Persian kings starting with Cyrus (the Great), the Persian king who allowed the Jewish people to return and build the temple. These two lines of succession will allow us to synchronize the events of Biblical and secular history in a way which shows the accuracy of the Biblical account. I’d encourage you to take a moment to familiarize yourself with these lists of names because we will be seeing them quite often as we explore the Biblical accounts. Keep in mind, our goal here is to determine to the best of our ability a reasonable Biblical context from which we can ascertain when the events in the books of Ezra and Nehemiah took place relative to Persian history and thereby establish a solid Scriptural foundation for the “Commandment to restore and build” of Daniel 9:25. In 536 BC after 70 years of exile in Babylon, Yahweh the living God of the Bible, reached down into the history of mankind and stirred the heart of the Persian king Cyrus to allow the Jewish people to return to Jerusalem. Jeshua (Joshua) the high priest (see above chart) and Zerubbabel let the first group of their Jewish brethren back to Jerusalem with the intent to rebuild the house of Yahweh. According to the account of Ezra chapters 1-4 the people didn’t get very far, before harassment by their hostile neighbors causes them to cease construction. 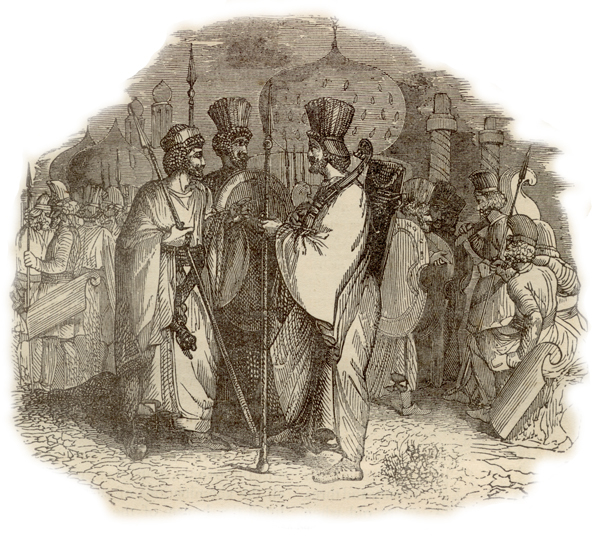 We know from Persian history, that there were only two Persian kings between the reign of Cyrus and Darius. As you see in the chart above, those kings where Cambyses (son of Cyrus) and Bardis the so called Magian imposter. What’s neat about Ezra’s account is that it confirms well established secular history. Or if you prefer, secular history confirms Ezra’s account. Ezra 4:6 tells us, the enemies of the Jewish people petitioned a Persian “Ahasuerus” to stop construction on the temple with no results. We know from Persian history that Cambyses (i.e. Ahasuerus) mostly followed in his father’s (Cyrus) footsteps and promoted the rebuilding of the religious monuments in lands under his control. So this makes sense that he would not be supportive of those who challenged his father’s authority and were trying to stop construction of a religious monument in his kingdom. In any case, the enemies of the Jewish people didn’t give up and when a new Persian king came along they were ready with their accusations once again. Ezra 4:7 tells us that this new Persian king titled “Artaxerxes” did indeed stop construction and this interruption lasted until the 2nd year of Darius king of Persia. And the elders of the Jews builded, and they prospered through the prophesying of Haggai the prophet and Zechariah the son of Iddo. This brings us to one of Nelson’s objections of reasonable doubt which we need to discuss. From here on out when I quote Nelson’s article on the Accelerated Ezra Chronology, his quotes will be in brown. Let’s explore Nelson’s objections here. We’ve just established the Biblical chronology from the 1st year of Cyrus up to the 6th year of Darius and the completion of the temple. Please note, in Ezra 6:14-15 above that it clearly states that the temple was “builded and finished” according to the “commandment” of God, Cyrus, Darius, Artaxerxes. Here is where context matters. According to the Biblical record, there were no “Artaxerxes” who gave “commandments” which helped build and finish the temple by the 6th year of Darius. Certainly the “Artaxerxes” of Ezra 4:7 didn’t help. He in fact stopped construction. Everyone else is clearly accounted for in the text. So who then is this Artaxerxes? The English word “and” connecting the title “Artaxerxes” to Darius is Hebrew letter “waw”. This Hebrew letter is often used as a conjunction and indeed as the context shows it is correctly used to distinguish between Cyrus “and” Darius, who were the bookends of the chronology in question. But the letter “waw” is also sometimes used as a subordination or hendiadys. What this means is that it does not necessary always refer to a different person, place, or thing, but rather as a subordination describing the previous noun. In this case, the writer of Ezra must be referring to Darius as “Artaxerxes” because we have no other contextual options. There is no other way to read this passage without breaking the golden rule of Biblical interpretation. The events of this passage are constrained by the 1st year of Cyrus until the 6th year of Darius (536-516 BC). Therefore Ezra was simply telling us that Darius was also known as “Artaxerxes”. The chronicler of Ezra began the book by referring to this king as Darius and consistently referred to him as Darius until the end of chapter six. If the Accelerated Ezra theory is correct, then at that point, the chronicler would have switched and begun to refer to him as Artaxerxes and consistently referred to him as Artaxerxes thereafter – with no explanation or reason for the change in names. Once again this is where the credibility of the Bibles account really shines. You see, there is a bit of Persian history that explains this change of title. According to Herodotus, after the death of Cyrus, Cambyses, his son, took the throne. 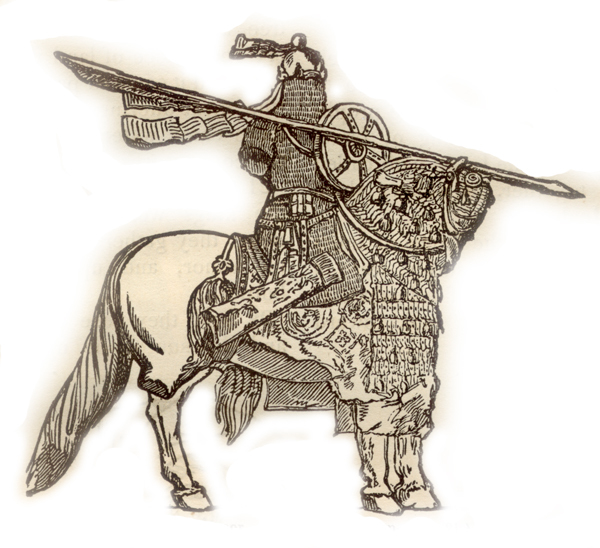 During Cambyses conquest of Egypt, Darius was a member of his royal bodyguard. On Cambyses’ return to Persia from Egypt, Cambyses mysteriously died in Syria and his brother Bardiya (a.k.a Smerdis) son of Cyrus took the throne. Darius in his Bisitun inscription claimed that this Bardiya was not really the son of Cyrus but an imposter and with the help of six Persian nobles he murdered Bardiya and assumed the throne himself. This didn’t go over very well in the rest of the Persian kingdom and there was revolts in many of the provinces. It took Darius several years to clean up this mess and assume total control over the kingdom. So Ezra’s account just reflected the realities of what was taking place from the provincial perspective. Keep in mind that Ezra’s narrative of this aspect of Persian history began in the 2nd year of Darius when Darius was in the thick of trying to attain control over all the provinces of Persia. If indeed Bardiya was the rightful heir and a legitimate son of Cyrus then he would have naturally assumed the title “Artaxerxes” at the death of Cambyses as described in Ezra 4:7. Even if he was an imposter and was impersonating Cambyses’ brother as Darius asserts, he still could have claimed the title “Artaxerxes” and most of his kingdom would not have known the difference. Whatever the case may be, it took Darius several years to gain complete control of the kingdom of Persia and its provinces and thus legitimately attain the title of “Artaxerxes”. This is one of those example of a seemingly confusing passage made clear once we understand the context. This should give us a renewed appreciation for the accuracy of the Biblical record. This brings us to the history of Ezra, the priest and scribe. Our previous chronology ended in Ezra 6 with the completion of the temple in the 6th year of Darius who the Bible tells us by that time had attained the title of Artaxerxes. Ezra 7 opens in the 7th year of “Artaxerxes” with Ezra on his way to Jerusalem to teach the people the Torah. Once again, if we take the Scripture at face value – in context – we are left with only one reasonable conclusion. Ezra left for Jerusalem in the 7th year of Darius a.k.a. Artaxerxes when the temple was completed. It’s simple, straight forward, and in context. We really don’t need any additional information to claim that Ezra was a contemporary of Darius Artaxerxes. But let’s look for some confirmation. Again according to our interpretive method, unless the context clearly indicates otherwise we must assume the most plain sense ordinary reading of the text. Such a reading of this text unequivocally indicates that Seraiah was Ezra’s father. This creates an insurmountable problem for N elson and those who believe Ezra was a contemporary of “Artaxerxes” Longimanus in 457 BC. The reason this is a problem is because Ezra’s father Seraiah was the last high priest of Solomon’s temple and he was killed in Babylon in the 19th year of Nebuchadnezzar (2 Kings 25:18-20). By the 7th year of Darius Artaxerxes, Ezra would have been at his youngest 69 years old. By the 7th year of Artaxerxes Longimanus, Ezra would have been at his youngest 126 years old. Which seems most reasonable? Keep in mind, that Ezra was still alive (and active) 13 years later when the wall of Jerusalem was finished and dedicated by Nehemiah. When suggesting that Ezra was a physical son of Seraiah, one must also consider the age of Ezra when he emigrated to Israel and why he waited until the 7th year of Artaxerxes to make the move. First, if Ezra was born in 586 BC (or earlier), the youngest he could have been in the 7th year of Darius the Great would have been 71. Although it isn’t impossible for a man of that age to make the four-month journey from Persia to Jerusalem, it is highly doubtful. Second, Nelson questions why Ezra, (who would have been in the prime of life in 536 BC when Cyrus allowed the first captives to return) did not return with Joshua and Zerubbabel. Interestingly, Ezra may in fact have returned to Jerusalem with Zerubbabel for a short period of time. In Nehemiah 12:1 a priest by the name of Ezra did in fact return to Jerusalem. The text does not tell us who this Ezra was, but we cannot say definitively that it was not our Ezra. And lest you think it unusual to find Ezra back in Persia by the 6th year of Darius, consider that the Scriptures tells us Nehemiah, as an officer of the king, traveled back and forth between Jerusalem and Shushan in Persia. If we are going to speculate here, we could assume a high likelihood that there was much traffic between the Jewish community in Judah and those still in Persia, including those Hebrew men who were officiating on king Darius Artaxerxes’ behalf. Here is another objection Nelson raises to taking the lineage of Ezra in its most natural and plain sense context. And the time drew nigh that Israel must die: and he called his son Joseph, and said unto him, If now I have found grace in thy sight, put, I pray thee, thy hand under my thigh, and deal kindly and truly with me; bury me not, I pray thee, in Egypt: But I will lie with my fathers, and thou shalt carry me out of Egypt, and bury me in their burying place. And he said, I will do as thou hast said. And he said, Swear unto me. And he sware unto him. And Israel bowed himself upon the bed’s head. As you can see “after these things” was used in a context that likely took place within a short period of time of Israel’s death. So clearly the 7th year of the Darius Artaxerxes mentioned in Ezra 7 could have taken place only a year “after these things” described in the 6th year of Darius (Ezra 6). Ezra really is important to fixing the chronology of the 2nd temple period. I’ve given you several reasonable pieces of Biblical evidence that show Ezra was a contemporary of Darius “Artaxerxes”. Now let me give you several historical references which also indicate Ezra was the literal son of Seraiah just as the Bible describes. These sources are not scriptural, but represent Jewish oral and written traditions as well as two reference from the apocryphal books of Esdras. At the very least these references show that Ezra’s contemporaneous relationship to Darius “Artaxerxes” was well understood by the Jewish people. Jewish Encyclopedia —– The Babylonian captivity lasted seventy years. Ezra sanctified Palestine in the seventh year of the second entrance, after the sixth year of Darius, when the Temple was dedicated (Ezra vi. 15, 16; vii. 7). The first cycle of shemiṭṭah began with the sanctification of Ezra. The Second Temple stood 420 years, and was destroyed, like the First, in the 421st year, on the closing of the shemiṭṭah (‘Ar. 13a). In conclusion I’ve given you several vectors of contextual Biblical evidence which all show that Ezra was the son of Seraiah and that he was a contemporary of Darius Artaxerxes. We’ve also looked at some historical records with the same conclusion. This evidence poses serious problems for anyone who believes that Ezra and Nehemiah were contemporaries of Artaxerxes Longimanus. It is important to stress here that no interpretation of prophecy, no matter how well-meaning or seemingly conclusive from our human perspective, can stand in the face of a single Biblical contextual fact that contradicts it. Ezra’s age is an obstacle to any theory of Daniel 9 which begins its countdown during the reign of Artaxerxes Longimanus. The only way around this obstacle is to ignore the plain sense – ordinary meaning of the words and the context from which they spring. Such an interpretive method must rely on doubt to fill the evidentiary void. As the ISBE Bible dictionary explains Sanballat is a name that appears quite frequently in the contract tables from the reigns of Nebuchadnezzar to Darius Artaxerxes, the son of Hystaspes. So seeing him mentioned in Nehemiah 2:17 as a contemporary of Darius Artaxerxes (son of Hystapes) is neither unlikely nor impossible. Both Cooper and Struse have suggested that the complex chronology of priests and Levites in Chronicles, Ezra, and Nehemiah suggest a ministry of Ezra and Nehemiah during the reign of Darius the Great, not during the reign of Artaxerxes I. Both men have compared the names of those who returned in 538 BC with lists of names found in relation to events in the 7th and 20th Years of Artaxerxes. What they found were that numerous names coincided. Because the number of years between 538 BC and 445 BC were so extensive, the conclusion was reached that it was impossible that these men could have all had a lifespan that long. The deduction was that “Artaxerxes” must have been an earlier king, Darius the Great. At first glance this theory seems insurmountable — and this was the proof that initially made me think that the Accelerated Ezra Chronology was correct. However, these lists of names are complex. First, the names of numerous priests and Levites were common and shared by multiple individuals. Names like Jeremiah, Ezra, Daniel, Zechariah, and Nehemiah as found in these chronologies belong to lesser known persons than the famous Bible characters bearing these names. Can we really be sure of any of the names in these chronologies? Frankly, I believe we need to question each name. Second, and much more important, a number of the names appearing in the lists of priests and Levites were “houses” or lineages not individuals. Although it is unlikely a single individual would live more than a hundred years, it is possible or even likely that a “house” or lineage would maintain the same name for decades or even centuries. First of all, Nelson is correct, there are multiple names and many duplicate names and each name must be considered in its context before any conclusions can be drawn. Nelson is also correct that some of the lists of names may represent “houses” or the heads of houses such as those listed in Ezra 2. Even though some of the names may represent the leaders or heads of houses, it doesn’t necessary follow that these listed heads of the houses were not actual men who lived during the period of time in question. I don’t have the space here to answer every example of “reasonable doubt” Nelson raised about this subject but what I can do here is provide you with several clear examples that provide sufficient context for you to have confidence in the plain sense meaning of the text. Let’s start with Nehemiah 12 and the list of priests and Levites that came up with Joshua and Zerubbabel in the 1st year of Cyrus (536 BC). As you read this passage keep in mind the author clearly states that these men were contemporaries of Jeshua (Joshua) the high priest. Now these are the priests and the Levites that went up with Zerubbabel the son of Shealtiel, and Jeshua: Seraiah, Jeremiah, Ezra, Amariah, Malluch, Hattush, 3 Shechaniah, Rehum, Meremoth, Iddo, Ginnetho, Abijah, Miamin, Maadiah, Bilgah, 6 Shemaiah, and Joiarib, Jedaiah, Sallu, Amok, Hilkiah, Jedaiah. These were the chief of the priests and of their brethren in the days of Jeshua. Now because we are following the golden rule of Bible interpretation, we must first assume the most plain sense reading of the text unless the context clearly indicates otherwise. So in this case we take the passage at face value. Just as Zerubbabel and Jeshua were leaders and real people (see Ezra 10:18 for example) so too we must consider the priests and Levites listed here as real people. As of yet, we don’t have any conclusive context that clearly indicates otherwise. Notice verse 7 does tells us, that the priests mentioned were “chief of the priests and chief of their brethren”. Again this statement does not have to be taken figuratively. The men listed can be real people who came up with Jeshua and Zerubbabel and still be the leading men of their age. In order to assume these were figure head names and not real people we must have clear context that indicates this is the case. Let’s explore more of the text to see if we can find some clear context which would indicate we are to assume these were not actual real living and breathing priests and Levites who came up with Jeshua and Zerubbabel. An important clue to the author’s intent is found in verses 10-11. Following the list of priests and Levites who came up with Jeshua, the author interjects Jeshua’s descendants (succession of high priests) so that the reader will have a clear understanding of the chronological context between the priests and Levites and how their service related to the chronological succession of the high priesthood. Now this may seem a bit odd to have the priestly succession interjected here until you read the next nine verses. What follows is a list of the descendants of the priests previously mentioned in verses 1-9. The author of Nehemiah 12 not only implies these men were the offspring of the previously mentioned priests, but he clearly states they were also contemporaries of Jeshua’s son, Joiakim. In other words, just as Joiakim was the 2nd generation after Jeshua the high priest, so too these men were the sons of the priests (the 2nd generation) who came up with Jeshua and Zerubbabel. Let’s look at a few of the names to get a clearer sense of what’s going on here. Nehemiah 12:1 tells us that Seraiah, Jeremiah, and Ezra came up with Jeshua and Zerubbabel and further that they were the chief of priests (leaders) during the high priesthood of Jeshua. Nehemiah 12:12-13 tells us that Meraiah was the descendant of Seraiah, that Hananiah was of Jeremiah, and Meshullam was of Ezra. Although the text does not say “son of” that is the most “plain sense” reading of the text. 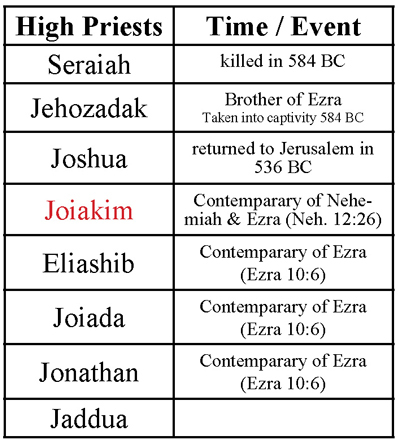 Remember here, these fathers were listed as priests who came up with Joiakim’s father Jeshua one generation previous. They were contemporaries. This is confirming evidence that in fact the men listed in Nehemiah 12:1-21 were real 1st& 2nd generation repatriated human beings not figurative heads of houses. Jonathan was a contemporary of Joiakim, and Shemaiah, his father, was a contemporary of Jeshua. With this context we have no other reasonable options but to conclude that Ezra and Nehemiah were contemporaries of Jeshua and Joiakim. And since Jeshua was a contemporary of Darius Artaxerxes this then makes Ezra and Nehemiah his contemporary as well. This confirms that the Bible should be taken literally when it describes Ezra as the son of Seraiah. The following chart provides a visual chronological representation of the information in Nehemiah 12. (For a higher resolution image click (here). Taking this verse in context, we find that it confirms what the Bible says about the context of the 2nd temple, i.e. that Ezra and Nehemiah were contemporaries of Joiakim and by chronological association Joiakim’s father, Jeshua. The “and” in this passage does not indicate separate periods of time as Nelson suggests but simply indicates that Ezra and Nehemiah were contemporaries of Joiakim, a 2nd generation repatriate. In regard to Struse’s calculation of the ages of the Chief Priests, he calculates Eliashib’s age in 445 BC as a minimum of 83 years old based on generational times of 20 to 30 years. Although 83 is a reasonable age for an elderly Chief Priest, Struse considers this an unlikely age for Eliashib because according to Neh. 3:1, Eliashib and his relatives built the Sheep Gate in that year. This logic fails for two reasons. First, generational time, especially over a short number of generations (Seraiah to Eliashib) can be highly variable. Men frequently have children after 30 years of age. If only one of these men was born to a father in his fifties, Eliashib’s age at the time of construction of the Sheep Gate becomes even more reasonable. Second, Scripture does not say that Eliashib participated in the construction. He may have simply overseen the construction (which was likely for a Chief Priest of any age). Even a man who was 83 years old could supervise a construction project. Regarding Nelson first objection, I agree the ages likely varied but not just on one side of the timeline. That is the reason my article sought to provide an average age of 20-30 years. Nelson’s scenario becomes problematic if just one of the generations preceding Eliashib were shorter than 30 years. There is quite a bit of conjecture here in Nelson’s statement and we just don’t have enough information from the text to verify it. He could be correct about the 22 priestly lines, but frankly, it is entirely speculative. What we do know is that the final “priest” listed in Nehemiah 10:8 is Shemaiah, the same Shemaiah who came up with Jeshua and Zerubbabel in 536 BC under the decree of Cyrus as listed in Nehemiah 12:6. This Shemaiah as Nehemiah 12:35 tells us was father of Jonathan a contemporary of Jeshua’s son Joiakim. Shemaiah was indeed the head of his people, but he was also a real living person who was actively involved in the resettlement of Jerusalem along with his son and grandson. And Ezra opened the book in the sight of all the people; (for he was above all the people;) and when he opened it, all the people stood up. And Ezra blessed YHWH, the great God. And all the people answered, Amen, Amen, with lifting up their hands: and they bowed their heads, and worshipped YHWH with their faces to the ground. Also Jeshua, and Bani, and Sherebiah, Jamin, Akkub, Shabbethai, Hodijah, Maaseiah, Kelita, Azariah, Jozabad, Hanan, Pelaiah, and the Levites, caused the people to understand the law: and the people stood in their place. So they read in the book in the law of God distinctly, and gave the sense, and caused them to understand the reading. 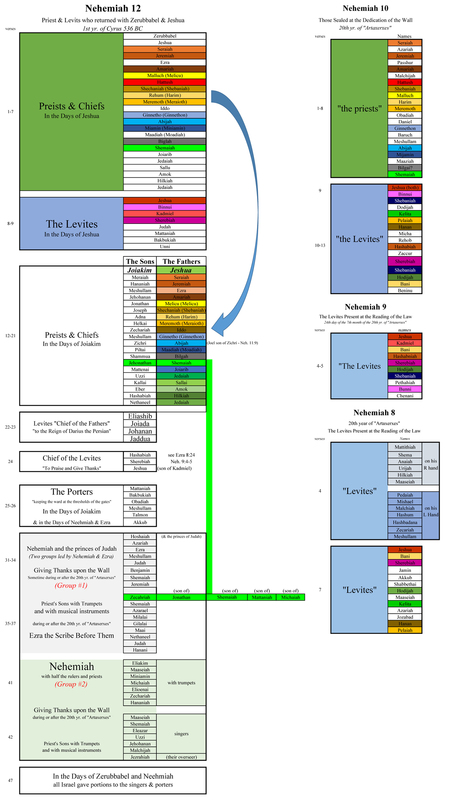 As you look at these charts, keep the “priests” and “Levites” designations in mind. These designations often help eliminate the confusion surrounding the use of multiple names in these different lists. This is important because if any of the “priests” and “Levites” who stood next to Ezra in Nehemiah 8 & 9 are real individuals who are listed in Nehemiah 10, then it provides reasonable context to show that the lists of Nehemiah 10 and 12 showed real people not the “heads of houses” as Nelson theorizes. Also worth noting is that many times the men listed in the book of Nehemiah, do not have “son of” or any other designation preceding or following their names. It seems incongruent to assume these men in Nehemiah 8 & 9 were real people (without the “son of” prefix) but those listed in Nehemiah 10 & 12 were not. As you can see from the above charts there were indeed “Levites” standing with Ezra who were also listed leaders of the people in Nehemiah 9 & 10. This provides contextual evidence showing that these lists of Nehemiah 12, 10, 9, & 8 included real people who participated in the events described, thus it shows that those priests and Levites alive in the 1st year of Cyrus (536 BC) were also alive by the 20th year of a Persian king “Artaxerxes”. The only reasonable conclusion then is that the “Artaxerxes” of Nehemiah is in fact Darius ‘the great’ whom Ezra 6:14 identifies as Darius “even” Artaxerxes. All this provides reasonable context to show that the priests and Levites who came up with Jeshua and Zerubbabel in 536 BC under the decree of Cyrus were still alive in the 20th year of “Artaxerxes”. As Nelson has stated in his article if these priests and Levites were real people then it is an insurmountable obstacle to his interpretation of Daniel 9 and the 70 Weeks prophecy. Not just Nelson’s interpretation, by the way, but every single interpretation of the prophecy which places Ezra and Nehemiah as a contemporaries of Artaxerxes Longimanus. That is 99% of today’s books on the subject. Much is at stake here. Although not mentioned in Nelson’s article, there is a fascinating bit of 2nd temple era history that brings important context to these events and helps clarify the profound influence Darius ‘the Great’ Artaxerxes had on the affairs of the Jewish people. Scholars have long wondered why the author of Nehemiah thought it important or relevant to mention this queen of Persia who was sitting beside king “Artaxerxes” when Nehemiah made his petition to return to Jerusalem. Why would a Hebrew audience care about a Persian queen? The answer to this question is another example of the chronological congruency of the Biblical record if we just allow it to speak in the natural contextual way it was meant to. I don’t know why, but most scholars today base their chronological assumption about Queen Esther and her Persian king in large part upon the theories of secular chronologists and ancient historians. They place Esther as the queen of Persian in the reign of Xerxes I who was the son of our Darius Artaxerxes because “historically” Xerxes I makes the most sense to them based upon what is written in the secular record regarding this Persian king. For the moment, let’s set aside secular Persian history and just see what Scripture has to say. Bear with me here, because I promise this information will help us synchronize Ezra and Nehemiah’s place in the 2nd temple era as well as provide you with a fascinating insight into the dynamics at play during this most important era in Biblical history. In Esther 2:5-6 Mordecai’s lineage is given relative to the Babylonian captivity. 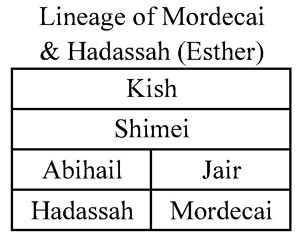 Since Esther and Mordecai are of the same generation, if we can determine a secular contemporaneous relationship of one of them we can also get a good idea of the other. To ascertain the timeframe of the events described in the book of Esther we have basically two choices based upon the information provided in Esther 2:5-6 (see above). What we need to know is which person was taken captive with Jeconiah king of Judah. Was it Kish the great grandfather of Mordecai or Mordecai himself? What we know from secular and Biblical history is that king Jeconiah of Judah was taken captive by Nebuchadnezzer in roughly 595 BC. This pretty much eliminates Mordecai as the person taken captive for the following reasons. Esther 2:4, 9, and13 tells us that Esther was among the “maidens” chosen to go in before king Ahasuerus. Maiden comes from the Hebrew word na’arah and describes a damsel, maid or young woman. This makes sense because if King Ahasuerus (a.k.a Artaxerxes) was looking for a new wife, it is unlikely that he was looking for an older woman. In any case, if Esther and Mordecai were of the same generation and Esther was a young woman when these events took place, then Mordecai was definitely not an ancient man when this Persian king began his search for a new queen. So clearly Mordecai’s captivity in 595 is not in view here because he would have been far too old to be the Esther’s uncle or an active participant in the events described. It’s important to note here that between the captivity of Kish in 595 BC and the 6th year of Ahasuerus (Xerxes I – scholars most favored historical candidate for Esther’s king), there are 114 years. The bottom line is that if you run the generational numbers you find that Esther was most likely a young woman in reign of Darius Artaxerxes. She would have not been old enough before this time and far too old after. This then would mean that Mordecai was one of the leading men of Persia during the reign of Darius Artaxerxes. If the chronology we’ve developed in this article is correct then you’d might expect to find Mordecai as one of those men who helped resettle Judah and Jerusalem. In fact, that is exactly what we find in Ezra 2:2 and Nehemiah 7:7. Fascinating, isn’t it? The only two places where we find the name Mordecai mentioned outside of the book of Esther is in the lists of men who helped resettle Jerusalem and build the temple with Jeshua and Zerubbabel during the reign of Darius Artaxerxes (Ezra 2:2, Neh. 7:7) . Indeed we find a Mordecai mentioned just as might be expected. Also keep in mind, that typically, when listing Hebrew men and women in the Bible their given Hebrew names are used, unless the names given to them by their captors are part of a Biblical tradition that stands alone in its own right. For example Hananiah, Mishael, and Azariah were given the Babylonian names of Shadrach, Meshach, and Abednego and those Babylonian names were used when retelling the stories about them in Daniel 2 & 3. Mordecai (worshipper of Mars) is clearly not a Hebrew name. It is of foreign derivation honoring a false god. Such a name would have been prohibited and an abomination to any Torah observant Jewish person. The only reasonable explanation for its use here in Ezra 2:2 and Nehemiah 7:7 is because it identifies a well-known (Jewish) Biblical hero associated with other events in the Bible. In other words, it is likely that Mordecai was mentioned In Ezra 2 and Nehemiah 7 to bring chronological clarity to the text. So when Nehemiah approached king Darius ‘the Great’ Artaxerxes of Persia in his 20th year and we find the queen “sitting beside him” we now understand that this is none other than Hadassah or Esther, the Jewish queen of Persia. This is just one more example which shows that Ezra and Nehemiah were contemporaries of Darius ‘the Great’ Artaxerxes. The Persian palace at Shushan is mentioned in only three books of the Bible. Once as a location in a vision of Daniel chapter 8. A second time during the 20th year of “Artaxerxes” in the days of Nehemiah (Neh. 1:1) and the rest of the references to this place are found in the book of Esther. According to Persian history Darius ‘the great’ Artaxerxes rebuilt Susa (Shushan) and made it his winter capital. The entire palace complex was not fully developed until the reign of Darius’ son Xerxes. Interestingly inscriptions (A2Sa & D2Sb) found on column bases at Susa indicate that the palace complex was destroyed by fire during the reign of Artaxerxes I Longimanus. The inscriptions indicate that Artaxerxes nearly completed the reconstruction efforts but it was not until the reign of Darius II (Nothus) that it was fully restored. Based upon the contextual evidence we’ve developed in this article, Darius ‘the great’ Artaxerxes was Esther’s king and the events related to her rise to this position as queen, took place in Shushan (Susa) the palace that secular history tells us Darius ‘the great’ built as the winter capital of Persia. Nehemiah 1:1 open’s with Nehemiah present at Susa in the winter month of Chisleu (Dec/Jan) in the 20th year of “Artaxerxes” a Pesian king whom the book of Ezra also identifies as Darius “and” Artaxerxes. Once again the Bible paints a very congruent and accurate picture of the events that transpired during the 2nd temple era as they related to Persian history. To give you a visual sense of how all of the individual’s we’ve talked about in this article relate to each other. Here is a chart showing the contemporaneous relationships between the Egyptian, Babylonian, Median, Persian, and Israelite kings as well as the Judean captives and Priests. The chart is based in part upon the work of Richard Edmund Tyrwhitt from his exhaustive two volume work entitled: Esther and Ahasuerus (1868). The chart has been modified by this author. And now to wrap it all up, please take a moment to read the following historical quotes. There are several but I assure you it will be worth the effort. What you’ll find is that Darius ‘the Great’ son of Hystaspes builder of Shushan was also known by the interchangeable titles of Artaxerxes/Ahasuerus and that it was during his reign that the events described in the books of Ezra, Nehemiah, and Esther took place. Think about what a profoundly important period of time this was for the Jewish people. Darius ‘the Great’ Artaxerxes was used by Yahweh to preserve the Jewish people, restore them to their land, and rebuild His holy temple. 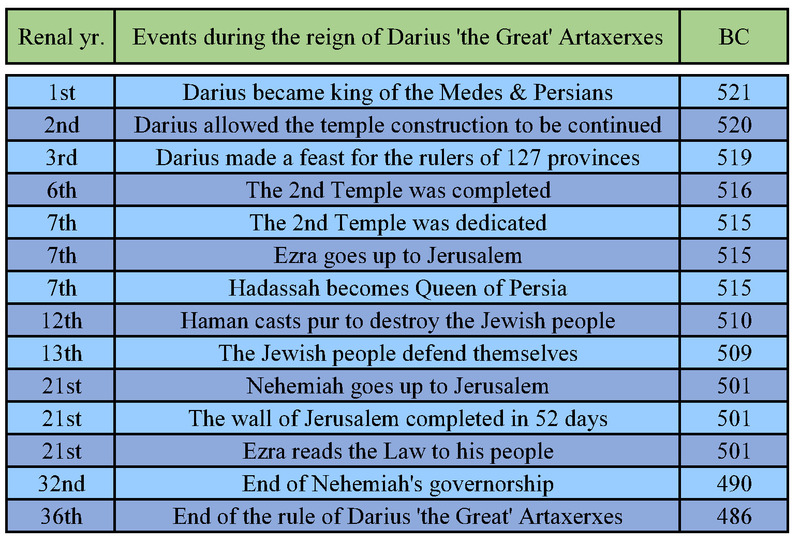 As you think about the implications I leave you with one final chart so you can grasp the context of these events as they relate to the reign of Darius Artaxerxes. As you think about the information I’ve shared in this article over the coming days and weeks. I hope you will ask yourselves if doubt is really the material you want to use in building a foundation for your interpretation of the Bible’s greatest Messianic prophecy. The 70 “Week” countdown to the Messiah begins with a dabar (word) to “restore and build Jerusalem”. Any prophetic interpretation of this important prophecy that does not clearly and contextual define this starting point relative to Ezra, Nehemiah, and the several Persian “Artaxerxes” must be taken with a Berean’s skepticism. Set aside your doubts for a moment and consider what real Biblical chronological evidence have you built your understanding of Ezra and Nehemiah’s place in the 2nd temple era upon? What is your evidence? I hope I’ve made it clear here that I have great respect for Nelson Walters. He is a talented writer with many great insights about Bible prophecy and the gospel in these end times. Over the years I’ve had the opportunity to discuss the subject of the 2nd temple era chronology and Daniel 9 with some of today’s most well-known prophecy teachers and scholars. Did you know that Nelson, after learning about this challenging subject, is the first one to take the subject seriously enough to discuss it publicly? To be sure, I disagree with Nelson’s interpretive method which sees reasonable doubt as a good enough evidentiary threshold upon which to build his understanding of Ezra’s and Nehemiah’s place in the 2nd temple era. I also disagree with the conclusions that this (what I believe to be) flawed interpretive method has resulted in. Having said that, Nelson is to be commended for the courage and conscience he has shown in his willingness to discuss this subject openly. Nelson could have remained silent like many of his better known peers, but he cares enough about the truth and his responsibility to you, his readers, to make sure you understand the challenges this subject poses to all of our understandings of the Bible’s most important Messianic prophecy. I hope you will honor Nelson’s efforts by also being faithful stewards of this subject and searching out this evidence for yourselves. Please don’t take just my word or Nelson’s word for these issues, but follow the example of those noble Bereans who searched the Scriptures daily to see if these things be so. I also encourage you to get your friends, pastors, and favorite prophecy teachers involved in this effort. Kindly ask them how they’ve resolved these important issues in their own study of the subject. Remember if they can’t provide a Scripturally based answer for their understanding of Ezra and Nehemiah’s place in the 2nd temple era then all they really have is a well-meaning but unproven (private) interpretation of Daniel 9. I look forward to continuing this adventure with you. This article is really the story of two books about Daniel’s 70 Weeks Prophecy: Daniel’s Seventy Weeks (2015), by William Struse, and my latest book, 70 Times 7 (2018). The article is being posted both on my website, at www.thegospelintheendtimes.com, and on Struse’s blog, at www.the13thenumeration.com. When Struse’s book was first published, I believed several of his insights were quite profound — specifically, that the “decree to restore and rebuild Jerusalem” in Dan. 9:25 was a command of the Lord (a dabar of the Lord) and that the “Prince who is to come” in Dan. 9:26 was the Lord himself. I incorporated both insights into a rough draft of my own book and sent it to Struse for review. I sent it to eight other teacher/authors who represented the full spectrum of eschatological thought as well. The insights of these teachers — some of whom agreed with me and some of whom did not — led me to revise my draft in very significant ways. When Struse read what I had written in my book, we began a rather earnest email dialog, because it was clear that I no longer supported his position and had, in fact, come to believe in my own very different principles for the Daniel prophecy. Still, we found that as brothers in the Lord, we were able to share our differences and advance our common understanding of this important prophecy. It’s that discussion that led to this article and to the posting of the article on both websites. With that background, I’d now like to “pull back the curtain” and share with the readers on our websites a little bit about how I came to write 70 Times 7, why some critical research didn’t end up in the book, and, perhaps most importantly, why it is important that Christians — regardless what theological interpretations divide us — must work together to advocate truth in scripture. For generations, the 69 “week” countdown to the first coming of the Messiah (Dan. 9:25) has confounded the ekklesia (Church) and divided those seeking to interpret end times theology. In scripture, the angel Gabriel told Daniel that it would be 7 “weeks” and 62 “weeks” from the “going forth of the decree” to rebuild Jerusalem until the Messiah appeared. YHWH provided this countdown so that the ancient Jews would specifically recognize the arrival of the Messiah as the “time of their visitation” (Luke 19:44). The mystery of this countdown hinges on several key questions: First, what exactly was it that Gabriel meant by “weeks” or “sevens” — which are English translations for the Hebrew word shabuim? And second, what is the starting point of the countdown? The most popular theory regarding the measurement of time for the countdown was introduced over a hundred years ago by Sir Robert Anderson in his classic book, The Coming Prince. Anderson proposed a starting point of 445 BC (the 20th year of “Artaxerxes”) and a “week” consisting of seven 360-day years. Although this has historically been Christian culture’s ”go-to” position regarding the Daniel 9 prophecy, both Struse and I disagree with Anderson — and our books contain dozens of proofs which collectively cast serious doubt on Anderson’s theory. Additionally, although Struse and I both disagree with Anderson, we also disagree with each other; and each of us has proposed a different solution to the countdown included in the Daniel 9 prophecy. Accordingly, the remainder of this article will focus first on a presentation of my argument regarding the prophecy; then — in a follow-up article — we will look at what Struse believes. I strongly recommend that you pick up a copy of both of our books so that you will be able to more thoroughly evaluate the complexities of our presentations. In the end, we leave it to our readers to consider our arguments and to draw their own conclusions. We ask only that you evaluate each argument with Christian charity and remember that perhaps only when Christ comes again will all things be made perfectly clear. In the days of Daniel, shabuim or “weeks” was a technical term for a sabbatical cycle of seven Hebraic lunar/solar years just as “decade” is a technical term for a period of ten years in our current culture. This word is used to refer to a seven-year period in Gen. 29:27. In Lev. 25: 1-7, the Lord commanded the Israelites to set aside the seventh year of the sabbatical cycle in the same way as a sabbath in a week of days was set aside. During this sabbath year, the land was to lay fallow and no agricultural work of tilling and reaping was to take place. In addition to these scriptural references, the Dead Sea Scrolls refer to sabbatical cycles as shabuim in numerous documents including the Damascus Document and the Book of Jubilees. Based on all these references, it is obvious that this was a technical term in ancient Hebraic culture. But Israel did not keep the sabbatical years. This lack of obedience was part of the reason for the 70-year exile in Babylon — so that the land could enjoy its rest (2 Chron 36:21, Lev. 26:34). Seventy shabuim (70 neglected sabbatical cycles) of sin resulted in 70 years of exile. So it was no wonder that Daniel who had been contemplating the 70-year exile would understand that the second grouping of 70 shabuim decreed by the angel Gabriel were sabbatical cycles of years as well; 70 shabuim of sin led to 70 years of exile which led to 70 more shabuim that would bring about the end of sin (Dan. 9:24). The symmetry was uncanny, and the direct link of the term shabuim to sabbatical cycles appears undeniable. The Lord also commanded the Israelites to count off every seven sabbatical cycles (49 years) and to celebrate the fiftieth year as a Jubilee year. (Lev. 25:8-12). So the 70 shabuim declared by Gabriel in Dan. 9:24-27 were not just 70 sabbatical cycles, they were also a period of 10 Jubilee cycles of 49 years each. The Dead Sea Scroll’s document, the Melchizedek Pesher, clearly defines that Jews of the first two centuries BC considered the Daniel’s 70 Weeks Prophecy as ten Jubilee cycles with attendant sabbatical cycles called shabuim. This biblical and non-biblical evidence about the use of the term shabuim in Dan. 9:24-27, that it was a technical term in ancient Israel, that neglected sabbath years were a cause of the 70-year exile Daniel was contemplating, and the fact that ancient Hebrews considered Daniel’s shabuim to be sabbatical cycles; clearly demonstrated to me that the term used in Dan. 9:24 can refer to nothing else but Hebraic sabbatical cycles. No other length of time is so clearly identified with shabuim in Scripture or in the Dead Sea Scroll literature. Yet as I tried to apply this length of time (483 years) to the 69 “weeks” countdown, truly none of the proposed suggestions for the starting point of the prophecy made sense with the six biblical requirements for the starting point set forth in Dan. 9:25. Then while reading Ezra 6:14, the answer hit me. The starting point wasn’t the command of God alone (dabar) or the decree of any one of the gentile kings, but it was the “going forth” of that command of God through the combination of the first three human decrees and the resultant efforts of the Jews in Israel. In Dan. 9:25, the starting point is indicated as the “going forth” of the decree to restore and rebuild Jerusalem. Only after God’s dabar had completely “gone forth” to fulfill all of its six requirements found in Dan. 9:25, was the starting point reached where counting should begin. This occurred with the return of Ezra and the remaining captives in the 7th year of Artaxerxes. If traditional Second Temple Chronology is used, this would be the secular year 457 BC. Exactly sixty-nine shabuim (483 years) later was the most likely year for the anointing of Yeshua at his baptism in AD 27. Since the end point of the countdown is given as to “Messiah the Prince,” and since messiah means “anointed one,” this seemed the most likely end point for the countdown. The exact precision of the starting point, the end point, and the 483 years made me realize I had likely uncovered the solution (see 70 Times 7, Chapter Six). Next, after testing this starting point against the six requirements in Dan. 9:25, I was even more convinced. Then I began hundreds of hours examining the Gospel and historical records. Everywhere I looked, the records supported this view: The Elephantine Papyri, the Dead Sea Scrolls, Josephus, the Gospels of John and Luke, etc. I now was 95% convinced that I had found the answer. Only one aspect still held me back: The Second Temple Chronology my colleague William Struse had established in his book on Daniel’s 70 Weeks — and which was originally proposed by Dr. David L. Cooper in his classic work Messiah: His First Coming Scheduled (1939). Any conclusion regarding the Chronology of the Second Temple Period must be consistent with both the evidence about the identification of the Shabuim AND the precise 69 Shabuim between the return of Ezra to Jerusalem in 457 BC and Jesus’s baptism in AD 27. In order to over-ride this overwhelming evidence about the 69 Shabuim, proof of an early Second Temple Period Chronology must be just as overwhelming. A REASONABLE DOUBT of the Accelerated Ezra Chronology Theory is all that is required to support the proposed 69 Shabuim countdown beginning in 457 BC. I realized I did not have to prove a ministry of Ezra during the reign of Artaxerxes I, I only had to provide reasonable doubt as to the Accelerated Ezra Chronology Theory. The overwhelming evidence as to the makeup of the Shabuim and the proposed countdown beginning in 457 BC would override a doubt-plagued theory about the date of Ezra’s ministry. When I first read William Struse’s Daniel’s Seventy Weeks and the proof for the Accelerated Ezra thesis, I had accepted it immediately because on the surface it makes sense. But I now realized that either my newly proposed countdown was wrong or the Accelerated Ezra theory was wrong. It was one or the other; and my gut told me the new 69 Shabuim countdown was right. It was simply too precise and backed by too much historic and biblical evidence. In Ezra 6:14, there appears to be a hendiadys that equates Darius the Great with the name “Artaxerxes.” equating all future references to Artaxerxes in Ezra and Nehemiah to Darius based on this supposed link. Ezra’s genealogy in Ezra 7:1-7 seems to state that he was the physical son of Seraiah, who died in 586 BC, thereby making it nearly impossible for him to have ministered 140 years later during the traditional date of the ministry of Nehemiah. The supposed ages of the Chief Priests casts doubt on traditional theory. Only two governors of Israel are listed in Ezra and Nehemiah, Zerubbabel and Nehemiah, and it is assumed they served immediately one after the other. The names of the gatekeepers, priests, and Levites who returned in the first wave of captives in 538 BC were later mentioned as still living during the ministry of Ezra and Nehemiah. Struse claims it would have been nearly impossible for these men to have had lifespans of that length if Ezra and Nehemiah served during the reign of Artaxerxes I.
I realized that it would be necessary for me to examine all five of these claims if I were to publish a theory that requires Ezra and Nehemiah to minister during the reign of Artaxerxes I. Although I am a reluctant student of long lists of names, I realized I was going to have to delve into the “weeds” of this theorem to see what Cooper and Struse might have missed. The books of Ezra and Nehemiah were probably assembled by a chronicler just like the one who also assembled I and II Chronicles and Daniel. Like the Book of Daniel, The Books of Ezra and Nehemiah contain direct quotes from the characters (Ezra and Nehemiah) and third person references (from the chronicler). Additionally, Ezra and Nehemiah contain a number of historical documents and lists. It is likely the chronicler had these letters, lists, and the personal writings of Ezra and Nehemiah at his disposal and assembled the books from that material. One must remember that Chronicles and the Books of Ezra and Nehemiah were written by scribes nearly 2500 years removed from our current day and culture. We must be extremely careful when interpreting these documents so as not to impose our modern standards on these ancient texts. These factors will be evident as we work through this document. Besides being of historical interest, the timing of Ezra’s ministry is of particular importance in determining both the events during the 70 Weeks of Daniel and the timing of ancient Jewish sabbatical years and jubilee years. So the chronology of his life and ministry is not trivial. But, there is controversy about when Ezra was born and when he ministered. The traditional chronology is that he traveled to Jerusalem during the 7th year of Persian king Artaxerxes I Longimanus (457 BC). However, biblical historians, Dr. David Cooper and William Struse, disagree. Their unique claims are that Ezra and Nehemiah ministered a half-century earlier during the reign of Darius the Great — and that Darius the Great was the Artaxerxes of the Book of Ezra. Since the Accelerated Ezra Chronology depends on the identity of the king titled “Artaxerxes” in Ezra 7, we should begin our investigation at this point. Unfortunately, all the names found in Ezra except “Cyrus” might be considered “throne names” (like Pharaoh was in Egypt). Any and all the kings could have utilized these names (Ahasuerus, Artaxerxes, and Darius). In Chapter Two of 70 Times 7, we demonstrate that Cyrus went by the throne name Darius the Mede. However, we must consider that it is most likely that the kings named in the Books of Ezra and Nehemiah are the kings that our current secular culture identifies by those names: Darius the Great, Xerxes I (Ahasuerus), and Artaxerxes I. But we really can’t be sure of their identities strictly from the names listed by the chronicler. Still, our default position must be that the names listed in Ezra refer to the kings who went by those names primarily in historical documents. The burden of proof must fall on anyone claiming something else. The chronicler of Ezra began the book by referring to this king as Darius and consistently referred to him as Darius until the end of chapter six. If the Accelerated Ezra theory is correct, then at that point, the chronicler would have switched and begun to refer to him as Artaxerxes and consistently referred to him as Artaxerxes thereafter —with no explanation or reason for the change in names. This is a highly unlikely scenario! In the Book of Daniel, two names are used to refer to the same king (Cyrus and Darius the Mede). However, the chronicler always refers to Cyrus as “Cyrus,” but when Daniel’s direct words are quoted, Daniel always refers to him as “Darius” or “Darius the Mede.” There is great internal consistency in how those names are utilized between the two authors. This is not the case in regard to the two names, Darius and Artaxerxes, in the Book of Ezra. In Ezra, the reign of one king is presented and then the reign of the second king is presented. In fact, the use of the word “reign” in Ezra 7:1, is another powerful textual piece of evidence that Darius and Artaxerxes are different kings. The chronicler specifically mentions a new reign, the reign of a king with a new name. If it was the same king and the same reign, why mention both of these things? There is a third piece of textual evidence in Ezra 7:1-7 that a new era had begun and that this was not the reign of Darius the Great. A rather uncommon Hebrew phrase translated “after these things” opens the verse. This Hebrew phrase is used in only two other places in the Old Testament and in both places, it implies a longer period of time. In combination with the mention of the “reign of Artaxerxes, King of Persia,” it is unlikely — highly unlikely — that only one year of time had elapsed since the previous verse in Ezra 6. In Chapter Two of 70 Times 7, we demonstrate how a hendiadys was frequently used in scripture when giving both the king’s throne name and his proper name. Cyrus is equated with Darius the Mede with a hendiadys in Dan. 6:28. However, there are three reasons that the supposed hendiadys in Ezra 6:14 is not a hendiadys at all, but rather is a reference to three distinct kings. First, in this case in Ezra there are three names not just two! The Hebrew text of this verse literally reads “the decree of Cyrus and Darius and Artaxerxes, King of Persia.” The word “and” (Heb: waw) upon which the hendiadys depends is found between each of the king’s names. So if this truly was a hendiadys, how is it to be applied? It might be a “triple” hendiadys, and linguistically Cyrus would have been called by these other names (Cyrus even Darius even Artaxerxes). Or perhaps the hendiadys is comparing the names Cyrus and Darius (Cyrus was known as Darius, Darius the Mede after all). I do not agree with either of those options, however, the usage here involving three names is unique in Scripture. In no other instance is a hendiadys used in the midst of three names. This casts doubt that the usage here is a hendiadys. Second, in the previously mentioned hendiadys in Dan. 6:28 and in the other well-known hendiadys in 1 Chron. 5:26, the throne names of the kings appear first and are followed by the proper names of the kings. In this instance in Ezra, the order of names is reversed. If this truly was an effort by the chronicler to equate Darius with Artaxerxes, the name “Artaxerxes” (the throne name) should appear first followed by Darius (the proper name). However, in this instance the names appear in the reverse order — which happens to be the exact historical order that these kings reigned (Cyrus then Darius then Artaxerxes I). Therefore, the order of the names of the kings in Ezra 6:14 also casts great doubt on this verse containing a hendiadys. Third, in the Greek Septuagint, the word “kings” (plural) specifies that the conjunctive form of “and” is in use; not a hendiadys. So although the hendiadys in Dan. 6:28 is well accepted and footnoted in many bibles, the supposed one in Ezra is not — and for good reason. Rather, Ezra 6:14 is a reference to the decrees of three separate kings that caused the dabar or command of the Lord issued in Dan. 9:23 to “go forth” (see 70 Times 7, Chapter Six). Finally, as we indicated earlier, Darius and Artaxerxes are not the only names of kings appearing in the text of the Books of Ezra and Nehemiah. And these other names cast some doubt on the Accelerated Ezra theory as well. As one can see, four separate kings are listed in this passage. According to the Accelerated Ezra theory, Ahasuerus and Artaxerxes were throne names for the kings that ruled between Cyrus and Darius (Cambyses and Bardiya). This is reasonable and possible. It is also very possible that these names refer to the kings that are best known by these names (Xerxes I [Ahasuerus] and Artaxerxes I). The four kings ruled in the exact order presented in this passage: Cyrus, Darius, Xerxes I, and Artaxerxes I. Either theory is possible, but the second theory casts doubt on the Accelerated Ezra proposition. 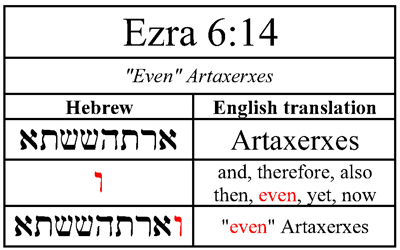 In fact, the use of “Artaxerxes” in Ezra 5 casts doubt on the Accelerated Ezra theory regardless of who the “Artaxerxes” was because it is very unlikely that the chronicler would use the name “Artaxerxes” to refer to one king in Ezra 5 (Cambyses or Artaxerxes) and then to Darius in Ezra 7. The chronicler must have been willing to refer to Darius as “Darius” in one part of the document and as “Artaxerxes” in another part with no logic or reason given. The chronicler must have been willing to refer to both Cambyses and Darius as Artaxerxes without any explanation. The chronicler must have entered the textual clues “after these things” and “in the reign of” without meaning to indicate the passage of time or a reign of a new king. The chronicler must have meant to infer a hendiadys but in a way that is not found elsewhere in the Bible. For all these reasons, Darius and Artaxerxes are most likely not references to the same king in the Book of Ezra. CONCLUSION: REASONABLE DOUBT of the theory that the Artaxerxes of Ezra 7 was Darius the Great. This is the most important area of consideration, because if the Artaxerxes of Ezra 7 truly was Artaxerxes I, our discussion is over; and the 7th year of Artaxerxes would be 457 BC. This introduction tells us Ezra’s lineage, his home (Babylon), that he was skilled in the Law, and that he emigrated to Jerusalem with many Temple servants in the 7th year of a king named Artaxerxes. It is this final fact that most traditional chronologies depend upon to date Ezra’s ministry. Ezra’s lineage in this passage may be a clue, however, to his age and the time of his ministry. This lineage is a “reverse transcription” from I Chron. 6:1-14 where a similar lineage is given. It is the lineage of the Chief Priests of Israel. Seraiah was the last Chief Priest of Israel prior to the Babylonian exile, and he was killed by Nebuchadnezzar himself in 586 BC (2 Ki. 25:18-21). If Ezra truly was the biological “son of Seraiah,” this would make him impossibly old in 457 BC. In fact, he would have been 129 years old (at a minimum) at that time, as he would have had to have been conceived prior to Seraiah’s death. Both Cooper and Struse assume the text of Ezra 7:1-7 means that Ezra was the direct physical son of Seraiah. That is a possible interpretation of the text, but of course, that is not the only interpretation. Immediately after the extensive lineage is presented in Ezra, the chronicler (speaking of Ezra in the third person) said “This Ezra went up from Babylon.” Ezra was a common name (another Ezra is found in Neh. 12), and the chronicler wanted to point out which Ezra this was. The chronicler also wanted to present Ezra’s credentials, and his lineage was one of the most impressive in Israel, stretching all the way back to Aaron. Nearly every other lineage in the Book of Ezra is presented as only a single generation-long: “___ the son of ___.” However, Ezra’s lineage is taken back all the way to Aaron in order to establish his stature and standing. Ezra may have been Seraiah’s physical son, but it is not impossible for a biblical lineage to skip certain generations and to list someone as the “son of” an individual, when in fact they were a later descendant. In Matt. 1, the lineage of Jesus is missing several of the kings of Israel. And in this specific lineage in Ezra 7, which delineates a 1000-year period from the exodus (from Aaron to Seraiah), only sixteen generations are given. One gap may be filled in by 1 Chron. 6:7-10, which supplies six additional names between Meraioth and Azariah. Therefore, this lineage, which the Accelerated Ezra Chronology depends upon, is incomplete! If it is incomplete in one aspect, might it be incomplete in more than one? That will be our working theory. An additional example of an incomplete lineage from the Book of Ezra is the claim that Zechariah was the “son of Iddo” (Ezra 6:14). Zechariah wrote that he was actually the son of Berechiah, the son of Iddo (Zech. 1:1). According to Zechariah, then, he was the physical son of Berechiah and the grandson or even an earlier descendant of Iddo. Might it be that the lineage of Ezra is missing his true father’s name as well, and that he was the grandson or even the great-grandson of Seraiah? Jews of the second temple period would still consider a grandson worthy of the title “son of …” So Ezra would have been a “son of Seraiah” even if he was his great-grandson. If this theory is correct, Ezra’s biological father may have been an unknown or even unimpressive man. Most likely, his father stayed behind in Babylon and was completely forgotten by the time the chronicler wrote Ezra. But the chronicler knew Ezra’s remarkable pedigree and thus included it. Another possibility, and perhaps the strongest reason for the inclusion of a “Seraiah-based” genealogy, is that at the time of Erza’s emigration to Israel, “Seraiah” had become one of the priestly “houses” or “courses,” and that when Ezra was referred to as a “son of Seraiah,” the reference was to his “priestly house.” We will discuss this later in the document. Interestingly, “Iddo,” was another of the priestly “houses” at this time which would explain the use of Zechariah’s title “son of Iddo” as well. Second, we must question why Ezra would have delayed and not returned with the first captives in 538 BC when he was a much younger man (48 years old according to Cooper and Struse) and much more capable of making such a difficult journey. Isn’t it more likely that he was several generations removed from those who were the first emigrants and emigrated during the prime of his life in 457 BC? All of these factors cast doubt on the theory that Ezra was the direct physical son of Seraiah. Remember the full weight of proof falls on the Accelerated Ezra Chronology Theory. CONCLUSION: REASONABLE DOUBT that Ezra was the physical son of Seraiah. Jeshua was the chief priest who returned with Zerubbabel (the governor) in the first wave of captives. He may have held his office until at least the second year of Darius (Hag. 1:1 — if this verse refers to the time of Darius the Great and not Darius the Mede). His son, Joiakim then became chief priest and held his office until Eliashib. And Eliashib was chief priest when Nehemiah first became governor (Neh. 3:1), which was the 20th year of Artaxerxes. Let’s examine a second scriptural reference. This may indicate that the “days of Joiakim” and the “days of Nehemiah and Ezra” were not the same but were two different periods — in other words — that the service of the gatekeepers referred to in this verse extended from the days of Joiakim to the days of Nehemiah/Ezra. This concept is supported by the fact that the Chief Priest during the era of Nehemiah was Eliashib not Joiakim. Thus, Joiakim and Nehemiah served during mutually exclusive times. Because the “days of Ezra” are linked to Nehemiah in this verse, it also strongly implies that Eliashib (and not Joiakim) was chief priest during the days of Ezra. Understanding the implication of all these clues requires a little bit of detective work. The 20th year of Artaxerxes I was 445 BC. We can make some assumptions and determine whether this seems reasonable, given the number of chief priests. If each chief priest served about 30 years (it is believed that chief priests served for life), this would seem a logical period of time. Jeshua’s 30th year of service would have then been 508 BC. Joiakim would have served until 478 BC, and Eliashib until 448 BC, which was almost exactly the year Nehemiah became governor. This estimate then, is reasonable. Bible historian William Struse has provided an internet article on exactly this same topic — a very complex article which attempts to estimate the ages of the Chief Priests. His conclusion from this extensive work is that the youngest Eliashib could have been in 445 BC was 83 years old. This is based on assumptions as to the ages of the Chief Priests and when their sons were born. His assumptions are that the generational time between priests would be 20 to 30 years. We will look at his analysis of the age of Eliashib and its implications in a moment. However, I want to first highlight the fact that in his article, Struse has confirmed our estimates of the years each Chief Priest would serve — 30 years. Since the reign of a Chief Priest in those days was lifetime, the reign of the priests would approximately equal the inter-generational time. In this case Struse has confirmed that a generational time of 30 years is reasonable, and thus our estimate of the time of service of each Chief Priest (30 years) is reasonable as well. By utilizing the data in Neh. 12:26, we can even further examine this theory. We have already seen in Neh. 12:26 that both Jeshua and Joiakim probably had to have passed on their titles of Chief Priest before the “days of Ezra and Nehemiah.” This would have required Eliashib to be Chief Priest quite a bit earlier than the 20th year of Artaxerxes; he would have had to begin service no later than the 7th year of Artaxerxes (during the “Days of Ezra”). Hag. 1:1 implies that Jeshua was still Chief priest in the second year of Darius. If these assumptions are both correct, then Joiakim had a very short term of service of five years or less. Not impossible, but unlikely. Conclusion: REASONABLE DOUBT that the number of Chief Priests or the age of Eliashib precludes the 7th year of Artaxerxes being 457 BC. Further support for a ministry of Ezra and Nehemiah during the reign of Artaxerxes I Longimanus can be found in the Elephantine papyri. The “Petition to Bagoas” is a letter from 407 BC and mentions the “Sons of Sanballat.” Sanballat was one of the opponents of Nehemiah and is mentioned in Neh. 2:17. If Sanballat opposed Nehemiah in the 20th year of Darius the Great (502 BC) as the Accelerated Ezra Chronology suggests, nearly a hundred years would have passed before this reference to his sons appears. It is so unlikely as to be considered impossible. In his book, Daniel’s 70 Weeks, Struse suggests that because only two governors are listed by name in the Books of Ezra and Nehemiah, Zerubbabel served until the time of Nehemiah. Zerubbabel led the initial wave of captives back to Israel in 538 BC. If Nehemiah began his governorship in the 20th year of Artaxerxes I, Zerubbabel would have had to have served as governor well past 100 years of age — a near impossible condition. For this reason, Struse supports a ministry of Nehemiah during the 20th year of Darius the Great. However, the Bible DOES indicate there were multiple other governors in Israel between Zerubbabel and Nehemiah. Not only does this disprove the conjecture about only two governors, but it also supports a ministry of Nehemiah in the reign of Artaxerxes I. We know from Ezra 6:15 that the Temple was completed in the sixth year of Darius. And we know from Zech. 4:9 that Zerubbabel completed it. Thus, in order for the Accelerated Ezra theory to be correct there must have been other governors (multiple) in the 14 years between the sixth year of Darius and the twentieth when this theory supposes Nehemiah took office. This is not impossible, but unlikely. Conclusion: REASONABLE DOUBT that the number of Governors supports an Accelerated Ezra theory. In fact, there were multiple governors between Zerubbabel and Nehemiah. In combination, these two factors undermine the Accelerated Ezra theory as we will see. This passage seems to indicate that Shallum, Talmon, and Akkub were actually the gatekeepers that returned from Babylon, and that Shallum remained the gatekeeper until the writer of Chronicles penned his work. Does that seem possible? I don’t think so. Shallum is given as the great-grandson of Korah (the great – grandson of Levi himself). Thus Shallum (the original Shallum the Gatekeeper) was the seventh generation from Jacob (through Levi). Since approximately 1300 years transpired from Jacob to the return from Babylon, we can easily say that the Shallum of 1 Chron. 9:19 was almost assuredly the “house of Shallum” (descendants of Shallum as supported by both Ezra in Ezra 2:42 and by Nehemiah in Neh. 7:45). Second, the question of Shallum being present at the gate until “now” (the timing of the writing of 1 Chronicles) is relevant. 1 Chronicles is believed to have been written at the earliest in 410-400 BC. That would make a single individual who emigrated in 538 BC at least 150 years old — and still working at that point in time! That simply isn’t logical. What is logical is that the house of Shallum (the descendants of Shallum) continually guarded the gate until that time. One can now appreciate the vast complexity of the chronicles found in Ezra and Nehemiah. When a “Shallum” is mentioned in Ezra, we cannot and must not assume this refers to a single man that emigrated to Jerusalem in 538 BC. This passage has been used as proof that this Shallum emigrated in 538 BC. We can now see that this mention was likely a namesake of the original Shallum (a common practice) or refers to the entire house or lineage of Shallum. In no way is this evidence that Ezra and a man who emigrated in 538 BC were contemporaries. Names in the Books of Ezra and Nehemiah which do not contain the addition of “the son of . . .” can be houses or lineages of a famous predecessor and are not necessarily individuals. First, notice that at the conclusion of this passage Nehemiah refers to the priests as corporate entities, as “the heads of the priests AND their kinsmen.” This implies that these names were “houses” or lineages of priests, just like the lineages of gatekeepers we examined previously. Given the number of priests provided by Ezra, each “house” could contain approximately 195 priests. Second, this assumption is further confirmed by the fact that none of these names are given as the “son of . . .” which is a very common practice in the Books of Ezra and Nehemiah when referring to individuals, especially when referring to them for the first time. Notice that the name of Zerubbabel the son of Shealtiel is presented in this way, indicating he was an individual. From this passage it is clear that the original names were “houses” — the “house” of Seraiah for instance. What other meaning could the phrase “of Seraiah” carry? I contend that this could be its only meaning. Were these four original courses redistributed into 22 new courses of priests? And were these new “courses” of priests the names we find in the passage in Neh. 12 above? There is no evidence of this directly, but it seems highly likely that this was the case. Many of the new names in Neh. 12 are of famous prophets and priests: Jeremiah, Daniel, Seraiah, Iddo, etc. Were these names chosen because of famous progenitors of the priestly lines? Possibly. Again, this list represents 22 priestly lines with only slight differences from the names of the priestly lines that formed in 538 BC. This slight difference in the corporate names of the priestly houses would be expected after the passing of 80-plus years. By listing the names of the courses of the priests, was Nehemiah indicating that representatives of these households signed the document on behalf of their entire household? Perhaps. Notice also that only one name, Nehemiah, is listed as the “son of . . .” indicating he is an individual. This is exactly parallel to the naming of Zerubbabel “the son of Shealtiel” as an individual in Neh. 12:1. It is extremely interesting that the name “Erza” doesn’t appear on the document that is signed in Neh. 10, especially given that he was the featured speaker in Neh. 8! Also missing is “Elaishib” the Chief Priest. Is it possible, even likely, that one or both signed the document on behalf of the House of Seraiah, both being a “son of Seraiah?” I think it is. In fact, the absence of the names of Ezra and the Eliashib the Chief Priest on the document casts serious doubt on the theory that these names on the document are individuals. Hilkiah Neh. 12:7 Hilkiah was one of the original “houses” of priests who came up with Jeshua. Was this Hilkiah in that group of priests? Hilkiah was a common name. Neh. 12:41-42 Four separate Maaseiahs were guilty of taking foreign wives. Maaseiah was a leader of the people who did sign the document. Zech. 12:35,42 This Zechariah could have been the prophet, but it would be unusual to not mention his titles: prophet or Son of Iddo. A Meshullam sang in the choir. The first thing that becomes evident in this list is how common many of these names were. For example, there were two Meshullams who became chief priests of the original priestly houses: Ezra and Ginnethon (Neh. 12:13,16). Another Meshullam became a gatekeeper, and one can assume yet a fourth became the father-in-law to Tobiah’s (Nehemiah’s nemesis) daughter. A large portion of the 13 names feature this repetition in the naming of several individuals. This commonness of names casts serious doubt on the use of names to prove the Accelerated Ezra Chronology. The second thing to consider is that for these men to have stood next to Ezra on this significant occasion (the reading of the Law), they would have had to have been highly regarded spiritually. Yet only one of their names, “Hilkiah,” appears in the list of “priests” or priestly houses that emigrated in 538 BC. If a number of the priests who emigrated in 538 BC and who are listed in Neh. 12:1-7 were still alive and able to sign the document in Neh. 10, why didn’t any of the other “priests” who emigrated in 538 BC (other than possibly Hilkiah) stand with Ezra? Isn’t it more likely that even “the Hilkiah” who did stand with Erza was a namesake of a famous Hilkiah and not a man who emigrated in 538 BC? We have already seen that famous names were held by multiple individuals. The lack of supposed priests who emigrated in 538 BC standing with Ezra casts enormous doubt on this theory that the similar names of priests in Neh. 12:1-7 and on the document in Neh. 10 were individuals. If we are to assume that the names of the priests signing the document in Neh. 10 are the names of individuals, we must ask, “Where are the names of the 16 chief priests under Joiakim who apparently did not sign?” Does this even make sense? Why would some of the most influential priests in Israel under Joiakim not sign the document, while older priests (found in Neh. 12:1-7) did sign? The only logical explanation is that these younger priests may have signed the document as representatives of their priestly houses; and that the names in Neh. 12:1-7 were those houses. This is further proof that the names of the priests found in Neh. 12:1-17, and as previously reflected on the document in Neh. 10, were the names of priestly houses, NOT the names of individuals. In conclusion, although it is impossible to say with absolute certainty that the names in Neh. 10 and 12 were “houses” or “courses” of priests and not individuals, the overwhelming evidence certainly points in that direction. For this reason, it has been the opinion of the majority of theologians throughout the years that these names were “houses” of priests and not individuals (see: Ellicott, Barnes, Cambridge Bible, Pulpit Commentary, Keil and Delitzsch, etc.). In my opinion, one should not use this evidence of reoccurring names to construct a different Second Temple Period chronology from the careers of Ezra and Nehemiah. Conclusion: REASONABLE DOUBT that the names of priests found in Neh. 10 and 12 preclude the 7th year of Artaxerxes being 457 BC. There is overwhelming biblical and non-biblical evidence that the Shabuim of Dan. 9:24-27 are sabbatical cycles of years. A precise countdown of 69 sabbatical cycles of years exists between 457 BC and AD 27 in likely fulfillment of Dan. 9:25. An Accelerated Ezra Chronology prohibits a simple, biblical definition of Shabuim being sabbatical cycles unless the modern secular chronology of Persian kings is mistaken (Cooper). And the Babylonian Astronomical Diaries establish the modern secular chronology of Persian kings is correct. So, the Accelerated Ezra Chronology and the biblically-supported theory of the 69 sabbatical-cycle countdown between 457 BC and AD 27 are mutually exclusive theories. Thus, the Accelerated Ezra Chronology must not simply be possible, but must be supported by overwhelming evidence to be accepted, because to do otherwise, ignores the substantial biblical and non-biblical evidence for the 69 sabbatical-cycle countdown. So in conclusion, our decision about the viability of the Accelerated Ezra Chronology must not be made in a vacuum. Rather, it needs to be made in the greater context of all biblical evidence regarding the Second Temple period of time. There is reasonable and significant doubt that Ezra and Nehemiah served during the reign of Darius the Great. For that reason, we must conclude that Ezra traveled to Jerusalem in the 7th year of Artaxerxes I, 457 BC. This research on the Accelerated Ezra Chronology does not appear in my new book 70 Times 7, but it underlies everything that was written there. It is at the prompting of William Struse that it is being published here for everyone to consider. Struse is to be commended for supporting the publishing of theories contrary to his own. Only someone who truly loves the Word of God and the truth is willing to undertake something like that. Let us all applaud him. How long is a “week” in Daniel’s 70 Weeks Prophecy? Many think each week is made up of seven 360-day years. Read on to find out why the weeks can’t be 360-day years. 70 Times 7: Daniel’s Mysterious Countdown and the Church’s Heroic Future is AVAILABLE NOW! Why did the disciples ask the question that launched Jesus’s Olivet Discourse? Might it be that the Olivet Discourse explains Daniel’s 70 Weeks? “And He will have nothing” from Dan. 9:26 is one of the THE most misunderstood phrases in the Bible. Read to learn more.